Terry Gray races to 91st USCS win during Senoia Summer Nationals IX at Senoia Raceway on Saturday (9/8/1 . Senoia, GA – September 8, 2018 – The Bartlett Bullett, Terry Gray from Bartlett, Tennessee raced past early race-leader and defending USCS Outlaw Thunder Tour presented by K&N Filters National Champion Jordon Mallett from Greenbrier, Arkansas on lap twenty-four of the 30-lap USCS Senoia Summer Nationals IX presented by FireAde main event at Senoia Raceway on Saturday night to grab the lead for the first time in the contest, He then took the high-side route to the www.RockAuto.com USCS Victory Lane over the final six laps to celebrate his second USCS Outlaw Thunder Tour win of the 2018 season and his 91st career win with the series. He has been the National Champion of the series eleven times as a driver and twice as Morgan Turpen’s car-owner. September 8, 2018. Mallett who started from the K&N Filters Pole Position land has nine USCS wins this season, led the first twenty-three circuits around the smooth, but slick 3’8-mile Gumbo clay oval with Gray who started outside the front row next to him, trailing in the runner-up spot for the first two laps. On lap three, The Alabama Outlaw, young gun Kyle Amerson from Matthews, Alabama raced past the veteran Gray into the runner-up spot. Amerson held on to the runner-up spot until lap fifteen when Gray got past Amerson to regain the spot. The 2000 USCS Rookie of the Year and former Southern Outlaw Sprint Series Champion, Michael Miller from Ocean Springs, Mississippi driving the Terry Witherspoon owned #99 came up to challenge and pass Amerson for the third position on lap seventeen. Miller then started to challenge Gray for the second position. On lap twenty-one Miller drove past Gray with a big slide job entering turn three. The move worked until the two exited turn four and Gray moved high where Miller was running to block Miller from passing him back as Gray won the race off the turn when Miller went high near the wall from his slide-job momentum. The move allowed Gray to find the rubber in the track surface three-fourths of the way up in the high groove. Three laps later, Gray reeled Mallett in and drove past on the high-side and raced away toward victory. A caution on lap 26 brought Mallett back to the veteran’s back bumper for a four-lap dash to the checkers but, Gray had the momentum and crossed the line for his 91st victory. 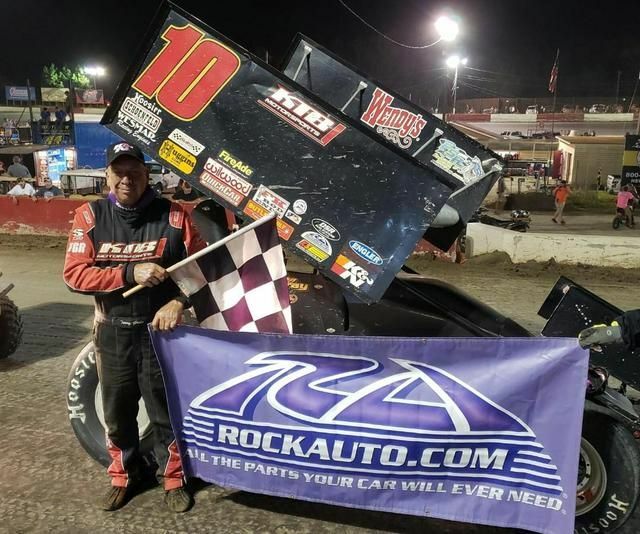 The win put him just ten wins from the top of the list behind retired driver, Kenny Adams from Malabar, Florida with one hundred wins in the series. Michael Miller finished in the K&N Filters Podium Award third place after starting fifth. Kyle Amerson followed Miller to the finish line in fourth place after running as high as second position. The 2016 USCS Senoia Summer Nationals Champion and two-time USCS National Champion, Morgan Turpen from Cordova, Tennessee was involved in a late-race tangle with a lapped car and was spun out in the incident. She then went ot the rear of the field to re-start/ then drove the Terry Gray Racing #10m back to fifth place at the finish. Tim Perry from Mooresville, North Carolina led the next group to the finish line in sixth place. Joe Larkin from Suwanee, Georgia, who ranks third in the current USCS Southern Thunder Tour regional series point standings, followed Perry in seventh place. Jeff Oliver from Pendergrass, Georgia was in eighth place at the checkers followed by 2012 USCS Rookie of the Year, Jeff Willingham from Ripley, Mississippi finished in ninth position and Danny Oliver from Pendergrass, Georgia completed the top ten drivers. Morgan Turpen kicked off the evening’s winged sprint car action with a win in the six-lap USCS Hoosier Speed Dash for the top six cars/drivers from the previous USCS event. Terry Gray then won the Engler Machine and Tool First Heat. His team-mate Morgan Turpen then put herself in position for a sweep of the evening’s competition by winning the Brown and Miller Racing Solutions Second Heat Race. Jordon Mallett earned the most passing points during heat race action. The first heat race winner, Terry Gray, as is customary, drew for the 0-4-6 inversion in the K&N Filters Pole Award drawing and placed Jordon Mallett on the pole and himself outside the front row by drawing a zero (inversion). In the USCS main event presented by FireAde, Tim Perry passed the most cars (five) to garner the Wilwood Disc Brakes Hard-Charger award. The USCS Outlaw Thunder Tour presented by K&N Filters will race at Carolina Speedway in Gastonia, North Carolina on Friday, September 14th. The race is a part of a two-night co-sanctioned North vs. South Shootout USCS vs.URC challenge event. On the following night, Saturday, September 15th the same two series compete again in the weekend’s Round #2 at Cherokee Speedway in Gaffney, South Carolina. For rules and updated schedule information about the United Sprint Car Series Outlaw Thunder Tour, please visit www.uscsracing.com or call the series office at 770-865-6097. You can also like the United Sprint Car Series Facebook page at USCS Racing. Photo/Caption #10: Terry Gray race to his 91st career win total in USCS Competition on Saturday night at Senoia Raceway. (USCS photo).